Mark Duncan at Yachting Partners International sends me details of three of the company's listings on display at the Cannes Yacht Show and in the vicinity from September 6th -11th. 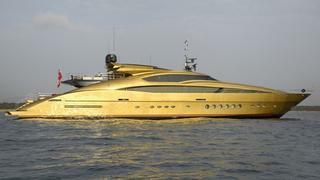 Firstly, there's O'Khalila, a 45.7m aluminium motor yacht built in 2007 by Palmer Johnson. This superyacht has two complete deck areas plus a raised pilothouse which blends into an extensive open-air deck. A modern interior by Nuvolari-Lenard accommodates 12 guests in six staterooms and she offers blistering performance, with three 3650hp MTU engines powering her to a cruising speed of 30 knots and a top speed of 34 knots. O'Khalila is asking $22 million. Then there's Glaze, a 49.07m ABS + MCA classed motor yacht. She's a Trinity 161 model, built by Trinity Yachts in 2007 to an in-house design and refitted in 2010. This superyacht can accommodate a total of 11 guests in one master, three doubles and one twin room, along with one Pullman berth.Glaze is on the market at $25.9 million. Finally, do make a point of visiting the 42.67m fast sailing yacht Senso One. Originally launched by France’s JMV Industries as Mari Cha IV in 2003, Senso One was designed by Philippe Briand and refitted in 2008. Several layouts have already been studied by the existing owner of Senso One with a view to giving her all the space and comfort to be expected from the very best luxury sailing yacht.